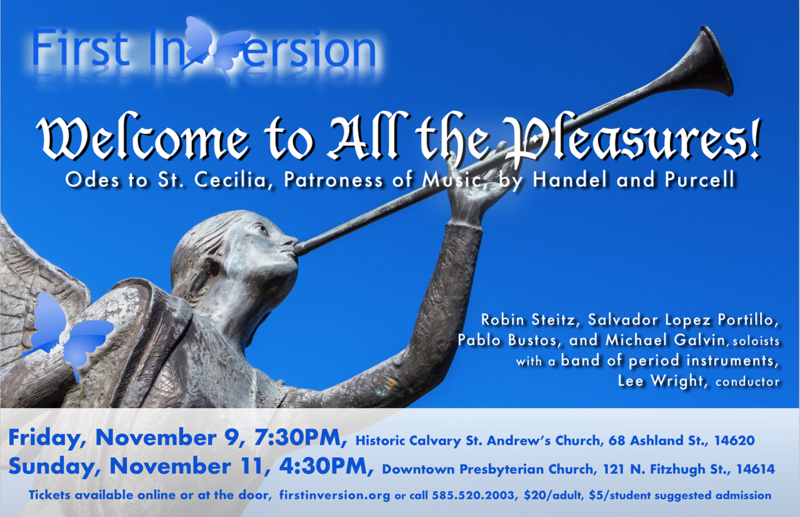 First Inversion presents “Welcome to All the Pleasures.” The concert features two odes to the Patroness of Music, St. Cecilia, by Baroque masters, Handel and Purcell. Soloists join First Inversion with an orchestra of period instruments. Handel’s “Ode for St. Cecilia’s Day,” and Purcells “Welcome to All the Pleasures,” were both written for the feast of St. Cecilia. Purcell’s work delights the senses with the gentle sounds of strings and continuo. Handel fortifies his longer work with flute, oboes, trumpets, and timpani.